The Boy with Giant Hands is suffering from a mysterious condition that has caused his hands to grow 12 Inches Long. This Boy is born with giant hands and dubbed as ‘the devil’. 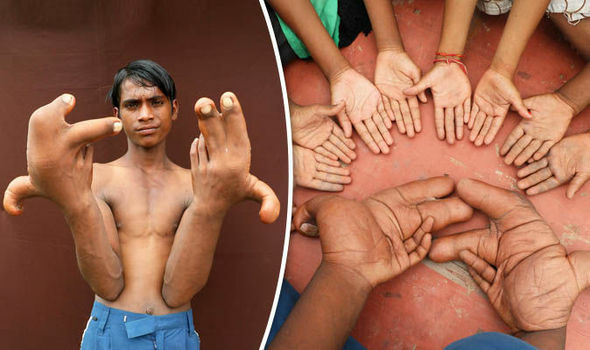 Certain disturbing pictures in circulation online purport to show an Indian Boy with Giant Hands that Grew over 12 Inches Long. There’s also a video showing the mysterious condition of the boy named Tarik which has gone viral on social media. Yes, the unfortunate condition of the boy with giant hands is a fact. Tarik is a young teenager boy from a village in Uttar Pradesh State of India. He had big hands since his birth and like visible in the pictures, Tarik’s hands got bigger as he grew up. His thumb and the next two fingers ballooned up in size, while the other two fingers remain in normal size. Facebook page Born Different shared a video of Tarik’s story with the title “The Boy With Giant Hands“. Tarik’s father consulted many local doctors to help his son, but they could not diagnose his rare condition and treat properly. After his death, Tarik is left with his mother and elder brother, who could not afford any treatment. Tarik’s brother Hargyan helps him with simple daily tasks as he finds it difficult to even change his clothes. As students fear his huge hands, the boy is even refused admission to school. Tarik works in a tea stall for a living. Tarik’s neighbors bully him for his unfortunate condition. Some even went on to say his large hands are the result of some curse. On the other hand, Tarik’s problem has been a mystery to local doctors, who never saw a patient like him. Nonetheless, some of the local doctors and professionals who saw the case through photos suggested Tarik’s disease is similar to Elephant Foot disease. But because the boy is suffering with the condition since birth, we believe the hand abnormality (local gigantism) could be associated with some genetic disease. Tarik’s family said the local doctors with no sophisticated treatment could not help the boy and expressed the concern they could not afford a good hospital. Tarik hopes he will get normal hands one day and becomes like other kids who go to school every day and play around. He also says he wants to earn bread and butter for his family and himself. Mohammad Kaleem, a young boy from a small village of the Jharkhand state in India appears to have born with similar condition. It caused his hands and arms to keep on growing. For your information, earlier a Chinese Man Lui Hua suffered with a similar large hand due to the condition called Macrodactyly. In case of Mohammad Kaleem, Dr. Raja Sabapathy from Tamil Nadu suggested some sort of remedy was possible to help him. The doctor and his team of expert surgeons at Ganga Hospital diagnosed his condition as Macrodactyly or localized Gigantism. They conducted an eight-hour surgery to debulk his forearm and hand. Further surgeries also reduced the growth plates to make sure his hand and fingers do not grow any further.